The MotorvatorTM is an exciting new development in the MeccanismsTM range. The Meccanisms product series is a system designed to enable almost anyone to harness the potential of today's powerful microcontrollers. 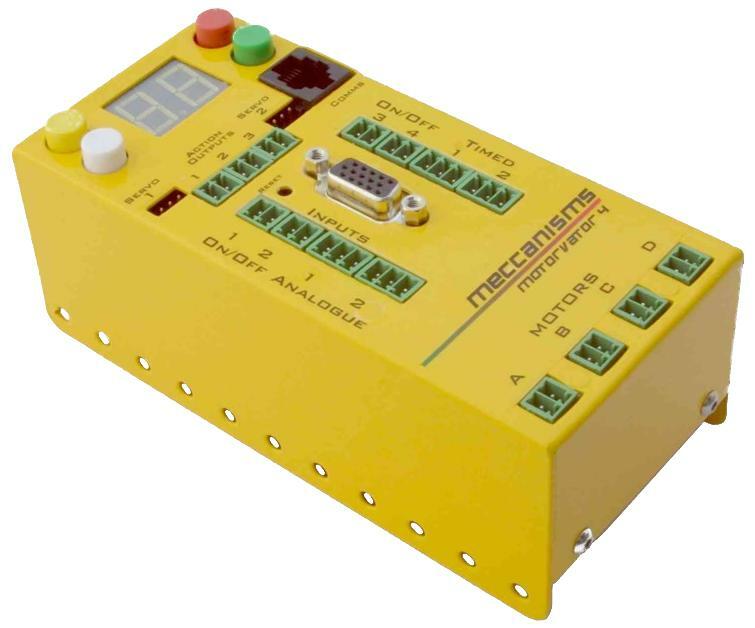 Based on a powerful microcontroller the Meccanisms design team has produced a compact package bursting with a powerful set of inputs, outputs and other features. The first product to be commercially available is the Motorvator 4, a system targeted at hobbyists, modellers and robotics experimenters. The system is designed to physically fit within the standard dimensions of most metal construction sets such as Meccano. In addition to supplying a wealth of useful inputs and outputs the system boasts a programming port to allow the Motorvator 4 to be programmed through easy to use Motorvate programming software available for Microsoft Windows. By giving hobbyists the ability to control their models via a computer following their instructions impressive automated or interactive models and inventions can be realised. Of course the Motorvator 4 is not limited to use with Meccano but for a wide variety of applications where automated control of motors and other devices is required in response to external events. This includes small DC motor control, robotics, home automation to mention just a few. 2 Servo Outputs Drive servo motors for precise steering or angular control. 180 degree travel with 1 degree accuracy. 3 Action Outputs Use these on/off ports to control lights, relays and other devices. 250mA drive. 1 Expansion Port This port provides 4 of the Digital Inputs and 4 Analog Inputs, allowing this port can connect to the Meccanisms Director for direct model control by joysticks and buttons. 4 Buttons For menu navigation and program control. Steel Case A steel case with Meccano-compatible mounting holes. Strong enough to be used as an integral part of your model. Powder coated in Red or Yellow.